I would wait until it falls off. You can gently run your finger over it every day, but don't pick at it. From my recent experience it looks like a bit of a scab. Give it the full 10 days. It should fall off soon. I'm keeping the cone on. Upon further evaluation, I think what I'm looking at is stitches. Here are a couple images of what I see; what do you think? Keep the cone on and post a pic for me to look at. Hey Guys! Just Checked out his tummy today and it looks like his stitches have fallen out on their own. The "remains" of his poms looks quite odd - but healed none the less. I'm not sure if they removed the whole scrotum or not honestly, the remains look a little black too. Do you think it's time I take the cone off? It's been 6 days now. Do they not have a spare pouch? I keep two or three in my cage. While 90% of the time the gliders all sleep together in one occasionally one goes off to be alone or they split up into two groups of two to sleep. Tonight Arthur was fine with the food dishes. Instead, he became protective of the pouch. Like, he wanted it all to himself. So, I let him have it... all to himself in his own cage. This is becoming so beyond frustrating, but it again leads me to believe it is internal, not a response to something external. While I was moving him, each of the other three decided it would be a great time to go explore. Greedy Morgana was the easiest to gather since she went straight for where I store the treats. Gwyn was next, wishing to play follow the glider into the bedrooms before getting cornered. Once I offered my hand, she jumped up & went for my shoulder. I returned them to the cage before going after Merlin since I was confident as to how he would react. I carefully placed a hand to each side of him where he'd stopped to watch me. Sure enough, after looking left then right, his anxiety seizures kicked in a couple of seconds later. A few violent twitches then he locked up. I scooped him up carefully (luckily he didn't have a death-grip on the carpet this time), put some treats under his head for once he recovered, then took Merlin to the bedroom with me. I sat there holding & petting him until he recovered. Then he ate the treats & I returned him. It has been quieter since all that hurly-burly. I would like to put Arthur back in with them, but I'm trying to send a message. There is also a part of me that also feels I'm being unfair if he's sick or hurting (which is why I let him rejoin the colony in the morning), but I cannot/will not allow him to bully the other gliders. When you search food aggression, I came up with about 18 pages listing posts and replies. This one has pics that may help. The PVC is slick. Having said that, mine didn't have any issues staying on them, and running on them. I don't recall seeing them jump from one perch to the other. The PVC pipe is easy to clean. I did make fleece covers for them only to find that they pee on them a lot and have to be taken out and washed weekly. Eventually, I removed them never to replace them . I went to fleece cage sets with hammocks, bridges and vines. Since then, I have built PVC pipe frame and 1/2" plastic mesh zip tied to it to make shelves for their feeding dishes (I have food aggression issues). Over time you may evolve to other means of places for them to run, jump and hang out... it will be up to you and what you feel your gliders need. Dawn, they make inexpensive baby monitors (night-cam-types) that should meet your needs. My sister has one that wasn't much (I forget, but low enough I was impressed) that provided a good enough picture you should be able to watch gliders... well, being gliders. Or being little !!!!s. Such as Arthur. About 30min after I hear the wheel start to thump go (& go & go & go), I hear the loud crabbing. When I look, Gwyn is in the wheel (no longer spinning) looking very still, Merlin is in the top corner looking down, & Morgana is 3/4 up the wall also looking down. Arthur is on the bottom, centered between three dishes, & eyeballing the other three. Yup, out he came & into the travel cage. Pulled some food to leave in the cage with him, moved the spare water bottle back, & he'll spend the night alone again. Hindsight being what it is, I should've made more effort to figure out what was going on or to catch them at it when I was noticing all the extra bickering. Still, even knowing about it, I feel my options are limited. Still looking for my cage hooks for their dishes that I used in my older cages (pretty sure I kept them) & am looking at other ways to reorganize their cage. Maybe create more blind spots between the dishes like Dawn was talking about. Im not new. Its been a long time ive forgotten all my info. 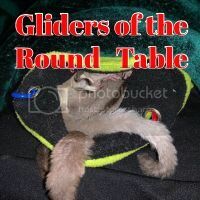 I bought 2 young gliders from a company for two rescues who had recently lost mates. I didn't know at the time I was buying from someone who would fall under the classification of mill breeder. I've rescued around 50 and have always been able to calm them down after awhile despite some of their horrific histories. These two, Stryker the male and Piper, his mate. Stryer is by far worse and is displaying the physical problems that are associated with chronic high stress, severe IBD and lower back problem's. This stress is not from the environment. My gliders live to around be 15 if toxin induced cancer doesn't take them. It only recently dned on me that I was dealing with an attachment disorder, Developmental Trauma. The breeder I bought these 2 from separates them out, too young it would seem, into boy and girl groups then put them together and mails them air. He's on IBD meds, that are not helping much, because I need to deal with his mental and nervous system problem. My previous vet and I were going to do some research in mental issues with exotics in captivity......but he died. Has anyone dealt with severe stress disorders aquired in early Joeyhood? Or know of or has heard of someone who knows of someone who has dealt with this? I know treatments for humans, but not for animals, and most would not even be doable. Can they hold on the pic? These plastic ones I got are ribbed but seem awfully flimsy. When I have a moment today for research, I'm digging into the archives. If you remember Terry, she had Lulu, Skadoosh and Ollie. They had food aggression issues too. She ended up concealing each dish (3) from view of the other dishes. I believe it was Ollie who had issues with the other two. He also had an issue with the floor of the cage. It and all the toys on it were his. Since Fiona is out of the big cage picture, Dot and Stewie still struggle with food aggression, just in a different way. As long as I'm present, all it well. Stewie can sit right next to her and eat. Dot will move to another dish and Stewie will follow, but keep his distance. When she's had enough, and goes back to her dish, he'll start in on his dish. I leave the room, and the bickering starts. But it's quick. I have yet to purchase a camera to observe what happens when I'm out of the room.... I'm still not sure of the most reasonable priced version with night vision. But I will have to get one soon. Actually the video upside down is a unique perspective. Have you considered using 1/2" PVC pipe for perches? The wooden perches don't last very long. I cut mine to length and notched them. I tried to get more footage but think the video is relevant either way. I think the joeys were suckling so I didn't move her. Edit: the video is upside down. I thought my phone would figure that out. I left Arthur on his own all night. In the morning before heading to work, I took him back out of the travel cage & returned him to the main cage to sleep with the colony. He accepted me taking him out of the pouch with no fuss & very little resistance, so I'm guessing he was quite lonely. After a quick sniff all around, the colony went inside the pouch together to sleep away the day. They had to wait for me to prepare their dinner. I was out in the garage until the sun was almost down (getting too dark to work). Had to move some packages in & do a quick wash-up. They were all up when I retrieved their dishes & Morgana leaped aboard for the ride. Sliced up an apple, placed in the cage, provided the tag-a-long with a treat before returning her, then laundry... all with an ear for the cage. Nothing. More laundry, restocked refrigerator, & still nothing. A little homework... still peaceful. Until just about 30 minutes ago. By the time I get to the cage, I can't see what was going on. Twice now & in spite of placing their dishes as far apart as I could. I'll listen a bit longer & if it occurs again, I'll separate him for another full night. Kimberley, I'll look at adding a third. I'm frustrated since I've never needed this before. I frequently use two, but it isn't uncommon for me to use only one & I've never hard this issue. I'll have to break-out the side-hooks to hang them on different levels. Four levels, I guess, since the dry food is already on another level.